Homebuddy is a tech-enabled brokerage that offers a unique service to homebuyers by continuing to support them after they purchase their home. Initially, they were offering users a place to input information about their home, and then Homebuddy would send reminders and tips about routine maintenance. They provided users with simple steps on how to do the projects themselves, giving them the ability to search for professionals in the area to complete the work for them. Early on our client learned from their users that they simply weren’t interested in doing routine maintenance around their homes. However, they saw an opportunity to provide a more comprehensive service to homebuyers and homeowners alike. This was a new shift for our clients and they looked to us to really figure out what users wanted from a service like this. This presented an exciting challenge for my team and me because there really was no other product like this currently on the market. Ultimately, we were able to assist Homebuddy in developing a digital product which addressed the needs of their users while aligning with their new business goals. Homebuddy came to us shortly after their pivot because they wanted to expand their app capabilities and widen their overall scope. The client wanted to assist millennial first-time homebuyers when they were just beginning their search by connecting them with a Homebuddy agent. Then, after they bought a home the client would assist them with the maintenance, repairs, and renovations by providing them with a concierge to coordinate with industry professionals. We had four weeks to complete this project and so we hit the ground running. I was a liaison between the clients and our team. Acting as the main point of contact, I corresponded with the stakeholders between meetings. What would millennials want & expect from a concierge? How would they want to communicate with the concierge? Do millennials want to handle repairs themselves? How would they want to hire professionals? Because Homebuddy had made this shift so recently, they had very little to provide to us in the way of onboarding materials or data. This meant that we had to cover a lot of ground very quickly. We started our exploration by conducting a competitive analysis and domain research. I personally love this type of research, so I dug deep into everything from real estate and mortgage brokerages, to understanding the home inspection and home buying processes, to learning more about working with service professionals. 68% of millennial homeowners have regrets about buying a home and wish they had been more prepared. One of the top regrets for millennial homebuyers was not understanding all the costs involved in maintaining a home. My team and I also needed to better understand our users, millennial first-time homebuyers, so we conducted user interviews as well as SME interviews. I was a liaison with the users and SMEs as well. I coordinated the interviews, some of which were in person and some of which were remote. I felt very comfortable moderating, so I conducted many of the interviews and testing during the next four weeks. What are users' fears or concerns before buying a home? What was their experience with a realtor, lender and inspector? What approach did they take for home maintenance and repairs? How did they see a concierge service benefiting them? It was only during the home inspection that most users started to think about the required maintenance and repairs. Users were more reactive than proactive when it came to repairs around their home. Users would be willing to attempt small projects on their own, although most admitted that they were not particularly handy. At the same time that we were conducting user interviews we decided to send out a survey because we wanted more insight from homeowners specifically, as opposed to those homebuyers who were just beginning their search. We asked them questions including: how comfortable they were completing DIY projects, how they typically researched home maintenance information, and what they would like to see a concierge offer. We shared the survey in a local Slack channel and received about 20 responses from homeowners. Only 35% of respondents said they felt comfortable with DIY projects around their home. 80% said they would be interested in home maintenance reminders and tips. 70% of respondents said they would be interested in a concierge service to assist them. Based on our initial research and the information we received from the kickoff meeting with Homebuddy stakeholders, we created a problem statement and journey map which we felt outlined a typical experience for a first-time homebuyer. The journey for Millennial first-time homebuyers is overwhelming, so they need a trusted digital service to bridge the gap between searching for a home and being a homeowner. After speaking with users and SMEs, we concluded that the best opportunity to introduce Homebuddy to users would be during the home inspection process. As stated, this is when most users were thinking about the maintenance and repairs for the first time. We pitched the idea to our clients and we received some valuable feedback. Essentially, that business model simply couldn’t work. They needed to engage their users during their initial search so that they could provide them with a Homebuddy real estate agent. It would need to be the commission from the home purchase which would pay for Homebuddy’s services, like the concierge.We knew that our clients were interested in the real estate sector, we just hadn’t realized how vital it was to their business mode. For us, this meant widening the scope but not necessarily changing course. What type of information do first-time homebuyers want? How do we present the value propositon of Homebuddy initially? What do users expect from a concierge service? How would users like to connect with service professionals? ‍An informational page that provides first-time homebuyers with basic tips and recommendations as they begin their search. This was one of my concepts. It was a piece of the puzzle that we were missing before. It would provide people with information, get them connected with Homebuddy realtors and lenders, and allow them to sign up for an account where they could get more personalized information. It was, essentially, a landing page with marketing. ‍A personalized page that provides the homebuyer with curated and comprehensive content to fit their timeline, budget, and location. This was another concept I developed with the intention of not only giving users personalized, useful information but also helping Homebuddy get customer information so that they can try to connect with them early in the home search process. ‍An all-in-one hub for all of your home appliance information, maintenance, repair and renovation needs. 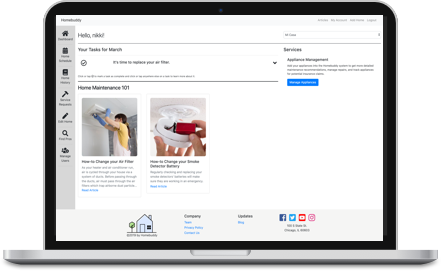 ‍A scheduling tool for homeowners to coordinate maintenance, repair and renovation requests with Homebuddy recommended professionals. ‍A concierge-like service that encourages users to upkeep their home by connecting them to professionals in the industry. The portal was too much of a barrier for users. We combined the concierge concept into the dashboard concept and scheduling concepts since there was a lot of overlap between them. We also made the recommendation that Homebuddy’s concierge be a real person, as opposed to just a digital service. Overall, users liked Homebuddy and they saw value in its intended services. We developed mid-fidelity wireframes and an interactive prototype which we took into a final round of testing with users. 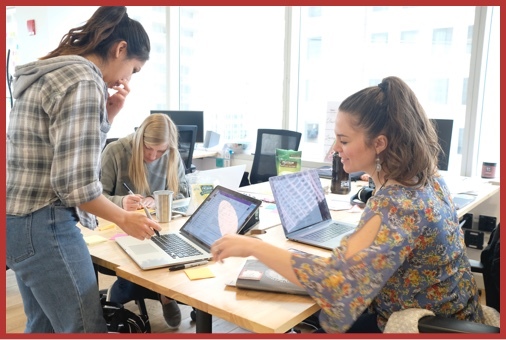 We used this as an opportunity to conduct both usability testing as well as a chance to get further feedback on some of our iterated concepts. A walkthrough of the final prototype can be found here. ‍‍Users needed a tutorial: Homebuddy was a new concept and users needed a better understanding of what it was and how to use it. Users need to see the data: Visual graphs were not enough, users wanted to see the numerical values and how they were calculated. Users needed to know that they can trust Homebuddy: Trust needed to be built over time in order for users to be able to rely on them. We presented our final prototype, user takeaways and future recommendations to our clients and they were thrilled. Homebuddy is taking our final prototype and using it in the hopes of getting VC funding. They had already been accepted into a local Venture Challenge accelerator and they were eager to have these designs just in time. It was exciting for me and my team to be a part of their project and I look forward to seeing how their business takes off. Working on this project was a fun and unique challenge for me because my team and I did our research and design creation while Homebuddy was going through a major pivot of their business model. This meant that we were learning a lot of new things together. I also personally grew as a UX Designer and Researcher. I took the lead on several interviews and strengthened my skills for both in-person and remote testing. We had a tight timeline of four weeks to complete this entire project and as the coordinator, I was able to keep us organized and on-track so that we were able to get everything done by our deadline. I truly valued this experience. It was really rewarding to be able to help Homebuddy not only better understand their user base but also to design wireframes which they could use right away to get the necessary funding and buy-in.